Leela, Orono's famous cat. This portrait was taken by Ashlee Thurow, whose house was Leela's "first second home," Mindy Crandall said. 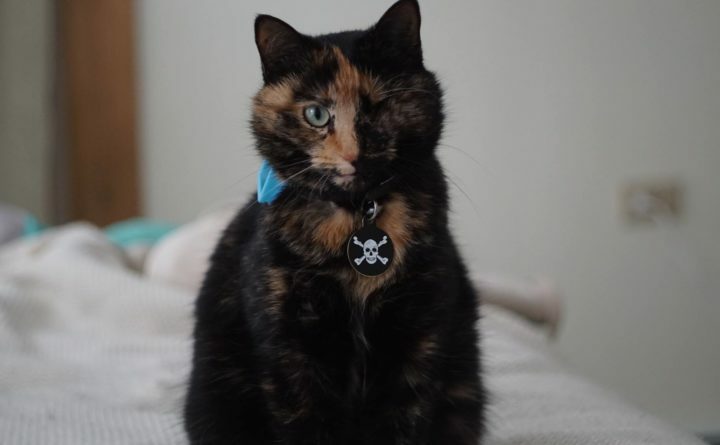 Soon after Mindy Crandall first adopted Leela in August 2014 from the Bangor Humane Society, it became clear that the one-eyed tortoiseshell cat was not happy with being confined indoors. So when Crandall, an assistant professor of forestry at University of Maine, moved to her downtown Orono home in 2015, she decided to let Leela explore the outdoors. 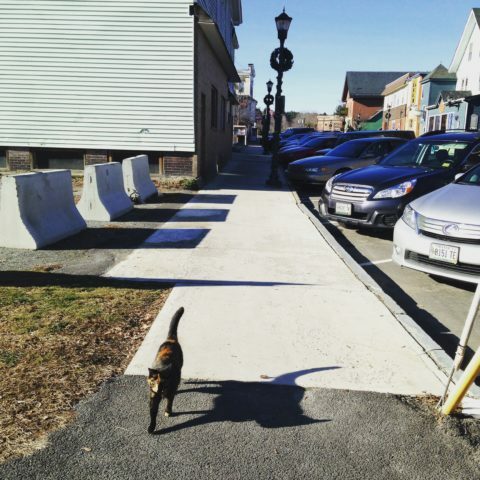 Leela quickly claimed the entire downtown Orono area as her territory, occasionally picking someone to follow to their home or car. Since Crandall would get multiple phone calls a day asking her to pick Leela up from wherever she had wandered off to, she decided to start a Facebook page hoping people would post photos and Leela’s location so she could virtually keep track of her adventurous cat. The page turned Leela into a local celebrity in Orono. And now, the town is mourning after Leela was hit by a car as she was trying to cross the highway Thursday afternoon. Crandall found out through a phone call from a police officer soon after Leela’s accident. She posted about Leela’s death on the cat’s Facebook page and received an outpouring of condolences and support. Crandall says Leela was around 4 years old. “Yesterday was really rough, I’m not going to lie, I spent most of the day crying,” Crandall said on Friday. During her three years in Orono, Leela explored dozens of coffee shops and restaurants, people’s homes, Orono schools and even the fire department. Anytime someone spotted the one-eyed cat in a local store or their neighborhood, they would post pictures of her on the Facebook page. She sneaked into the Asa Adams elementary school when she could, and was a big hit with the kids, Crandall said. “More times than I can count I heard, “That’s your cat?? I came home and she was in my house!” or “Sleeping on my bed!” or “She sneaks in through the bathroom window on the third floor from the roof!”” Crandall said in her announcement of Leela’s death on Facebook. Leela loved hunting rodents at night, and walking along the river trail. Crandall equipped her with a GPS tracker and a collar with flashing lights to help drivers see her at night. She always used the crosswalk when she crossed the street, and would check in with Crandall every day when she came home for food. With everyone in town looking out for her, Leela never got lost. 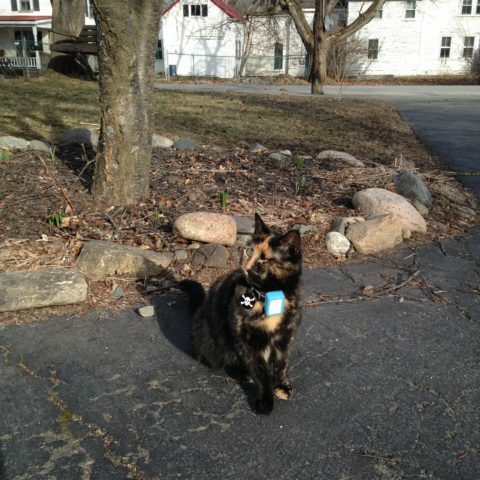 There are many cats wandering the streets of Orono, but none received the welcome Leela did. “There are plenty of cats that roam the streets but this one, who really didn’t like people, became such an important part of the community,” Roberta Bradson, owner of The Store Ampersand on Mill Street, said. About two years ago, Leela decided to start hanging out at The Store Ampersand. On most mornings, she sat outside, waiting for the store to open, Bradson said. If Leela was in a social mood, she would let store visitors pet her, and if she needed quiet time alone, she would run to the very back of the store, to Bradson’s office, and nap on the orange couch. Leela roams the streets of Orono. After hearing about Leela’s death, the staff at The Store Ampersand, which Crandall called Leela’s second home, set up a memorial for Leela with her photos and a notebook for visitors to write their favorite Leela memories in. Within a few hours of putting the notebook out, several pages were filled with drawings and anecdotes of Leela’s adventures. Bradson said she planned to give this notebook to Crandall after leaving it for visitors to fill over the weekend. Crandall also credits Leela with helping her establish a life in Orono. Once people found out she was Leela’s owner, they would start talking to her about the cat. “She brought me into the community as well, I think that was part of the reason why it was so hard,” she said. Crandall remembers a phone call she got a few months ago from some UMaine students who told her that Leela had followed them from downtown to campus. On the way, a deer ran out on to College Avenue. Leela positioned herself in front of the deer, as if to defend the humans from the deer, according to Crandall’s recollection of the anecdote. According to Crandall, that spoke to who Leela was; fearless, fiercely independent and always on the lookout for her next adventure. Crandall buried Leela in her front garden, where she would sit and scout a person to follow. In all her years of owning cats, Crandall said she had never encountered one with such a unique personality, and one that was loved by so many people.